Great for shakes, baking, & cooking. Less than 1 g sugar (Not a low-calorie food. See nutrition facts panel) per serving. Soy free. No sugar added (Not a low-calorie food. See nutrition facts panel). Less than 1 g sugar. Gluten free. Bakes well. 23 g protein per scoop. 50% Whey protein isolate. 40% Micellar casein. 10% Milk protein isolate. 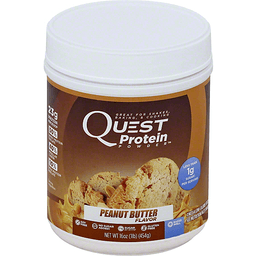 Taste, Reimagined: Quest flavored protein powder is a tasty decadent blend, even when it's simply mixed with water! We've transformed casein and whey isolates into impossibly delicious flavors that are distinctly Quest. But we didn't stop there. Cheat Day, Everyday: Quest Protein Powder is a groundbreaking cooking companion for your favorite (hashtag)CheatClean recipes. 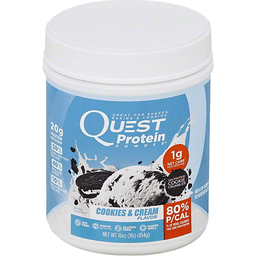 Use Quest Protein Powder to cut the carbs in everything from milkshakes to muffins. It's an incredible ingredient swap to turn a carb-heavy cheat into a protein-rich treat. Protein/Calorie Ratio: We believe a great protein powder should have a high protein-to-calories percentage. Quest Protein Powder has one of the highest percentages of any protein because we don't add any unnecessary ingredients. It's just amazing taste and excellent nutrition. questnutrition.com. This package is sold by weight, not volume. Some settling of contents may have occurred during shipping and handling. Great for shakes, baking, & cooking. With protein cookie crumbles! 1 g net carb (7 g carbs - 1 g fiber - 5 g erythritol = 1 g net carb). per serving. Soy free. Less than 1 g sugar per serving (Not a low-calorie food. See nutrition facts panel). Gluten free. Bakes well. 20 g protein per scoop. 50% Whey protein isolate. 40% Micellar casein. 10% Milk protein isolate. Recipe book included! Find recipes at QuestNutrition.com/Cookbook. Share your Quest recipe with us (hashtag)cheatclean. Facebook. Instagram. Twitter. YouTube. You may see your recipes features! At questnutrition. questnutrition.com. This package is sold by weight, not volume. Some settling of contents may have occurred during shipping and handling. Baking Just Got Better: Feed your creativity with Quest Protein Powder. We've transformed whey, casein, and milk protein isolates into impossibly delicious flavors that bake unbelievably well. This groundbreaking cooking companion lets you swap out the carbs to turn your favorite cheat-day treats into delicious (hashtag)CheatClean creations. It also makes incredibly tasty protein shakes - just add water! Visit QuestNutrition.com/Cookbook for more clean cooking inspiration! P/Cal - Protein/Calorie Ratio: We believe a great protein powder should have a high protein-to-calories percentage. Quest Protein Powder has one of the highest because we don't add unnecessary ingredient. It's just amazing taste and excellent nutrition. To find the P/Cal of any product, multiply the protein grams by 4 and divide by the total number of calories. Compare use to your favorite brands and see! (20 g protein x4)/100 calories = 80% P/Cal.